After a battle of nearly two years, Jay Hammond lost his bout with cancer on November 12. He passed at his home in Florida, his wife Galena and mother at his side. Born in Altoona, PA, he was raised there and in Gettysburg. He graduated from St. James School in Hagerstown, MD and went on to Lehigh University. While an undergraduate there, he was introduced to the sport that would eventually become life-long passion – wrestling. He covered the sport as a staff writer and eventually the sports editor of the campus newspaper, the Brown and White, and the campus radio station, WLVR. Following graduation, he was employed as an engineer and then attended the University of Akron where he followed an interest in banking. After moving with banking jobs from Ohio to Boston to New York and then San Francisco, he decided to change careers again. He became a computer programmer and settled down in Orlando, Florida. Around that time, he had met and eventually on December 30, 1999, married Galina Blinova, a native of St. Petersburg, Russia. He was truly devoted to her, and many friends said she had mellowed him. And she allowed him to maintain his “other love” – wrestling. 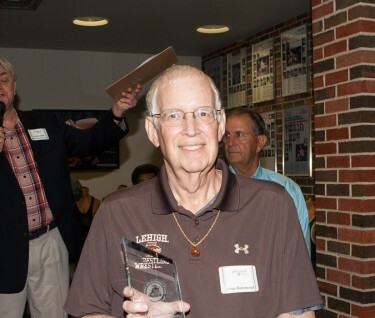 Jay himself was never a wrestler, but he was a true fan of the sport, attending multiple NCAA and EIWA tournaments, world championships and Olympics. That passion eventually transformed into his determination to chronicle the history of college wrestling. In 2006, with the publishing support of the National Wrestling Hall of Fame and Museum, he authored The History of Collegiate Wrestling. This book is considered to be the definitive history of the sport, following it back to the first NCAA wrestling tournament at Iowa State in Ames, Iowa. It lists specific eras of the sport and highlights individuals who made significant contributions. After the book was published, he would tell friends how, more than once, someone had told him that the book had helped them “shut up the office load-mouth” who had falsely claimed to have been a college wrestling champion. He also regularly contributed to “Amateur Wrestling News,” other periodicals and various chapters of books and publications. He was collaborating with another writer on an updated edition just weeks before he died. In the June of 2013 Jay was elected by the Board of Governors of the National Wrestling Hall of Fame & Museum as a lifetime Governor Associate for his service to the organization as its official historian. Once in Florida, he worked as a programmer and he continued to travel with his wife, regularly returning to Russia, along with tours to Italy and the Mediterranean. And he would always get to the NCAA finals. His illness prevented him from attending the 2013 NCAAs, breaking a string of over 20 years in attendance. In his final weeks, Galina said how she would see his energy level ramp up whenever a “wrestling person” would phone him to talk and she appreciates all who reached out to him in those days. Jay had told friends that his plans included surviving at least another three to six months, but the cancer had other ideas and claimed him in his sleep on the prophetic day of 11-12-13. He is survived by his wife and mother, both of Gotha, Florida, a brother, and a step-son, step-daughter-in-law and step grandson. He also leaves behind a legion of fellow wrestling fanatics. A group who were as passionate about the sport as he was. The family held a private memorial service for Jay on Friday, November 15, 2013 in Gotha, FL.